The electronics company is partnering with Marriott International and Legrand to use tech to improve the guest experience. Total Tech Summit sponsor Samsung is playing a leading role in bringing the Internet of Things to the hospitality industry and potentially changing its future. Marriott International is turning to Samsung and Legrand to take a leap forward in including IoT devices in its hotels. Marriott has been working toward this goal at its IoT Guestroom Lab at the company’s corporate headquarters by exploring the concepts that have the potential to elevate the guest experience. The Lab is exploring ways in which multiple responsive IoT systems, devices and applications can communicate with one another to serve guests and optimize hotel operations. To help achieve this goal, Marriott is featuring Samsung’s ARTIK Smart IoT platform, which bills itself as end-to-end IoT. It unifies hardware, software, cloud, security and a partner ecosystem in a single offering. Marriott executives believe Samsung can help create the intuitive system they deem critical to innovation across its 30 brands. 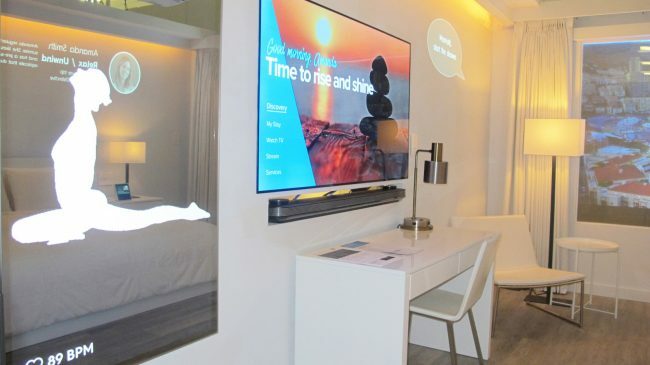 The technology they are working with in the IoT Guestroom Lab allows a user to do such things as ask a virtual assistant for a 6:30 a.m. wake-up alarm, start a yoga routine on a full-length mirror, request additional housekeeping services and start the shower at the desired temperature stored in their customer profile – all by voice or app. Such a system also would benefit hotel owners, with minimal equipment requirements and an integrated experience for them to access their own data and information. It even would improve hotel operations by increasing the personalization of amenities, like allowing staff to provide services to guests at their desired time. The IoT Guestroom Lab is running for three months, and Samsung, Marriott and Legrand experts will analyze feedback on the usage of the technology. Marriott executives say guests will start to see the elements of the technology in hotel rooms within the next five years.